Ballymena Bears were presented today with a fantastic Christmas present from the Triangle Housing Association charitable Giving Group. A grant for £405 means that the team will be able to purchase wet proof tops for their training sessions that take place every other Sunday at Ballymena RFC, Eaton Park. The Bears have stopped for the worst of the Winter now, but will resume again on Sunday 3rd March. Anyone wishing to play or help would be most welcome to come along. 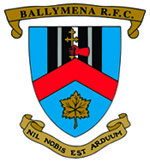 In the meantime more information can be found on Ballymena RFC’s web site or visit the Bears own Facebook page. The Ballymena Bears met at the Mid Ulster Sports Arena on Saturday 25th August to be part of the celebrations to welcome the Para Olympic flame to Cookstown. The Bears put on a demonstration of rugby skills and tag rugby and welcomed all spectators to join in and have some fun. The group were also proud to show off their new shirts which they have been raising money over the past months to buy. The sun shone and there were smiles all round as the group helped form a guard of honour for the flames’ arrival and its journey up on to the stage at the Arena. A great curtain raiser for the start of their new season on Sunday 2nd Sep 10am at Eaton Park. The Ballymena Bears offer tag rugby (non-contact) to young people with learning difficulties and would welcome anyone who wishes to come along and play or help, they meet every other Sunday at Ballymena RFC grounds. This weekend was a busy one for the BRFC Bears with the coaches meeting up at Eaton Park on Saturday to be trained in First Aid and the section undertaking their first ever away trip on Sunday to Newforge. Six of the coaching team started early on Saturday to brush up on their First Aid skills. A fantastic tailored training day package was delivered by Janice Bisp of Bisp Training. Janice kept the group entertained and just before lunch turned the theory into practical with the coaches getting to practice their CPR skills on a range of demo models from adults to babies. Throughout, Janice shared her vast hospital casualty department experience, giving lots of helpful practical advice on some of the possible scenarios to be faced. A huge thanks to Janice for giving up her Saturday to come and present to the team. On Sunday the Bears travelled down to Newforge RFC to meet up with the Taggers, Dungannon Sharks and Donaghadee Sharkies. This was the first ever trip away from Eaton Park for the Bears and a fantastic travelling contingent of 9 met up at the Ulster RFC training ground. The section immediately got involved in a shared warm up with approx 50 other young people from the other clubs. They then broke into club teams and the Bears got their chance to show off their newly acquired tag rugby skills in front of Luke Marshall the Bears patron, Chris Henry, Darren Cave and Dan Tuohy all from the Ulster team. After 6 games it was time to share a cup of tea and meet up with all the players and Sparky in the clubhouse. Everyone got to wish the Ulster boys good luck for the forthcoming HEC final next week and there was even a quick rendition of “Stand up for the Ulstermen”. A rousing close to a superb inaugural away trip; Well Done the Bears!